Hours after photos of the alleged Boston marathon bombers were published by the Boston Police authorities, The Police has been able to identify and neutralize one of the bombers. 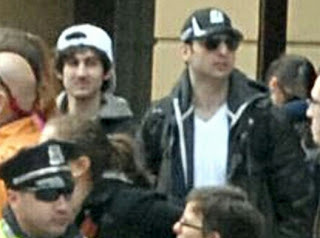 The two suspects have been identified as Brothers from Chechnya. The pair Dzhokhar A. Tsarnaev (19 years old) and Tamerlan Tsarnaev (26 year old) were connected to the bombing via video footage from surveillance cameras. The elder Tamerlan was killed in a firefight with the police which left one police officer dead and another seriously wounded. The pair were found out by a campus police officer at the Massachusetts Institute of Technology campus, who was fatally wounded in a gunfight with the pair, the police responded quickly to the gunfire and a manhunt ensued for a Mercedes Benz SUV in which the pair had escaped with. On discovery the pair engaged the police in a firefight which left one police man critically wounded and also one of the suspected bombers who was confirmed dead on arrival to the hospital. The older bomber had suffered multiple gunshot wounds to the torso. The police are still searching for the second bomber who fled the scene on foot.